Taylor Francis Barras (born January 22, 1957) is an accountant and banker from New Iberia, Louisiana, who is a Republican member of the Louisiana House of Representatives for District 48 in Iberia Parish. On January 11, 2016, as he began his third term in the chamber, Barras was unexpectedly elected state House Speaker by his colleagues, who rejected on the second ballot Representative Walt Leger, III, of New Orleans, the choice of Democratic Governor John Bel Edwards. Barras received fifty-six votes, seven more than Leger's forty-nine. Since the days of Huey Pierce Long, Jr., legislators had confirmed the governor's choice for Speaker, but the Republican House majority instead elected Barras despite the preference of the governor. A New Iberia native, Barras (pronounced BAH RAH) is the third of four children of Mazel Borel Barras (1924-deceased) and Elton Joseph Barras (1923-2007), a decorated United States Army first lieutenant in World War II, who operated a country grocery store from 1951 until 1969 and was then from 1969 to 1983 served as the chief deputy under Iberia Parish Tax Assessor Clegg J. LaBauve, Sr. (1906-1987). Elton Barras was elected to succeed LaBauve as tax assessor in 1983 by handily defeating Erland "Ticky" LaBauve (born May 1947); he held the position from 1984 until his retirement in December 2000. In 1975, Taylor Barras graduated from New Iberia Senior High School, an entity of the Iberia Parish School System. In 1975, he received a Bachelor of Science degree in accounting from Louisiana State University in the capital city of Baton Rouge. He is the market president of Iberia Bank. His wife is the former Cheryl Lopez (born February 5, 1957). In 2011, Barras became one of several members to switch to GOP affiliation. As a result of several special election since 2010 and party defections, Republicans gained a majority of the state House for the first time since Reconstruction. Barras was reelected to a second term in the nonpartisan blanket primary held on October 22, 2011. In his first term, Barras served on these committees: (1) House and Governmental Affairs, (2) Municipal, Parochial and Cultural Affairs, (3) Ways and Means, and (4) Joint Legislative Committee on Capital Outlay. In 2010, Representative Barras was rated 100 percent favorably by the Louisiana Association of Business and Industry, 82 percent by the Louisiana National Federation of Independent Business, and 89 percent by the Louisiana Family Forum. In 2011, Barras voted, unsuccessfully, to override then Governor Bobby Jindal's veto of an increase in his state's cigarette tax. He also voted to ban hand-held cellular devices while driving. He voted against a 2011 proposal to establish a commission to study how to end state corporate and personal state income taxes over the next decade. Barras predicted no shortcuts to the reconciliation of the state budget, the first agenda item in the special legislative session set for mid-February. "None of the choices are easy or ideal, but we have to face them," Barras said. In 2015, Barras won reelection without opposition to his third House term. 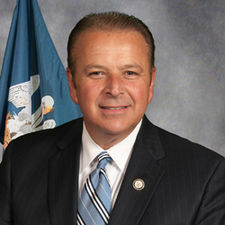 In 2018, Speaker Barras, who has been described as "low-key" and "genial", obtained House passage of his two high-priority bills, one sought by Uber and Lyft and the other by Harrah's New Orleans casino. Both measures died in the state Senate, under the leadership of the Moderate Republican John Alario of Jefferson Parish, a former Democrat associated with former Governor Edwin Edwards. Beginning on June 18, 2018, Barras presided over the seventh special legislative session of the John Bel Edwards administration. At issue is the pending renewal of one-third or one-half of a one-cent sales tax increase approved in 2016 and set for expiration. Edwards vetoed the one-third tax and then called another special session to push for the one-half cent tax, which Barras has opposed. A supermajority of seventy state representatives is required for passage of tax increases in Louisiana. Edwards lashed out at Barras by vetoing eight infrastructure projects in Iberia Parish, measures which had gained legislative approval. Edwards said that he would cut scholarships in the popular Taylor Opportunity Program for Students (TOPS) by 30 percent if the one-half cent tax is again rejected. Shortly after holding firm on tax increases, Barras reversed himself to support the Edwards-backed revenue package with retains .45 percent of the temporary one-cent sales tax. Barras' moved signaled to wavering Republican that they could support the package without controversy. ↑ Taylor Barras. Mylife.com. Retrieved on June 18, 2018. ↑ 2.0 2.1 Greg Hilburn (January 22, 2016). House Speaker Taylor Barras: No shortcuts. The Alexandria Town Talk. Retrieved on January 23, 2016. ↑ Elton Joseph Barras. Findagrave.com (September 23, 2007). Retrieved on January 23, 2016. ↑ Rep. Barras, Taylor F.. mobilelgs.com. Retrieved on August 26, 2011. ↑ Louisiana primary election returns. Louisiana Secretary of State (October 20, 2007). Retrieved on June 18, 2018. ↑ Louisiana general election returns. Louisiana Secretary of State (November 17, 2007). Retrieved on June 18, 2018. ↑ Rep. Barras joins GOP. The Baton Rouge Advocate. Retrieved on August 23, 2011. ↑ Rep. Taylor F. Barras: Republican District 48. house.louisiana.gov. Retrieved on August 26, 2011. ↑ Taylor F. Barras. votesmart.org. Retrieved on August 26, 2011. ↑ Tyler Bridges (June 17, 2018). House Speaker Barras' leadership will be tested once again in upcoming special session. The Baton Rouge Advocate. Retrieved on June 18, 2018. ↑ The Moon Griffon Show, June 25, 2018.